Through the decades of the 1960s and 1970s computers generally became both smaller and faster, which led to evolutions in their architecture. For example, memory-mapped I/O lets input and output devices be treated the same as memory. A single system bus could be used to provide a modular system with lower cost[clarification needed]. This is sometimes called a "streamlining" of the architecture. 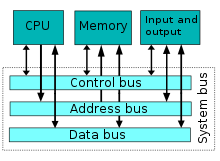 In subsequent decades, simple microcontrollers would sometimes omit features of the model to lower cost and size. Larger computers added features for higher performance. ^ "Electronic Computer Project". Institute for Advanced Study. Retrieved May 26, 2011. ^ Johnson, Roger (April 2008). "School of Computer Science & Information Systems: A Short History" (PDF). Birkbeck College. University of London. Retrieved July 23, 2017. ^ Dijkstra, Edsger W. "E. W. Dijkstra Archive: A review of the 1977 Turing Award Lecture". Retrieved July 11, 2008.